Well look at you. You finally made it. Your first Mother’s Day in Heaven. Your prayers have been answered. I’m so proud for you. All that suffering you went through down here is now long behind you. There has been many years that I didn’t get you a gift for your special day, but WOW you got a special gift this year. I can picture you walking the streets of Gold, Worshiping our Lord in song. That beautiful singing voice of yours has been restored. Not much doubt in my mind that you are leading the Heavenly Choir in praise. By now, I’m sure you have been reunited with all the family that went Home before you. You loved to watch the Gaither Homecomings…..I would suspect, by now, that you have sang with Jake Hess, George Younce, and Your all time favorites…The Chuck Wagon Gang. Just a reminder, mom. Go easy on Vestal Goodman. It will be hard on her now that she’s not the highest voice in Heaven. Guess you two can do a duet and maybe you can hold back just a little so she will not be embarrassed. Man, I can’t wait to sit and listen to you again someday. Somehow, knowing you are in Heaven has renewed my spirit. You’ve gathered up your grandbabies and are spoiling them, trying to keep dad in line, and loving every second of it. This will be the first time I cannot personally tell you “Happy Mother’s Day, I Love You.” Words mattered little to you and I over the past 8 years. That old stroke took your voice and crippled your old body but it was unable to cripple your spirit. Your eyes always told me that you loved me too. You were my first love, you gave me my first kiss, you loved me unconditionally. No matter what “dumb” thing I did (and there were MANY) you were always there to help me pick up the pieces. You knew how to heal “booboo’s,” mend broken hearts and to help a little boy believe in himself. Everything good, everything true, everything loving that I learned, I learned from watching you. Life will be much different without you here but I will carry on until we meet someday…..Over the Rainbow…..In Heaven. Janice Pinson (upper left) and her girls. We, at the Wood County Appraisal District, are in shock over the death of our beloved Janice. Janice went home to be with the Lord this past Saturday afternoon. This story begins several months ago when Janice’s son, Jade Allen, became ill. About a two months ago Jade’s condition worsened. Janice spent many hours with him at the hospital and at hospice. Sadly, Jade did not recover from his illness. His funeral was two weeks ago tomorrow. Janice was devastated over the loss of her only child. She is such a trooper that she came back to work the following Wednesday. Obviously, she was very distraught but she felt being back among her co-workers/family would help to maybe ease some of the pain. Janice was the light of our office. Despite the troubles that she may have had in her life, she was always more concerned about the troubles we might be having. Rarely did a day go by that she didn’t ask about my mom. Janice was unable to attend mom’s funeral as she sat with her terminally ill son. That did not keep her from calling and offering her condolences. At Jade’s memorial service, as we passed by the casket bearing her son, she apologized for not being there for me. That was Janice….even during the intense grief she was experiencing she took the time to make sure I was going to be OK. AMAZING!! Last Saturday night, I received a call from Alba Fire Chief Shawn Newland. His words are forever etched in my memory…..”Byron, Janice is missing.” My heart sank as I soaked in those words. I could tell by the tone of his voice that it was serious. As I drove the 5 or so miles to her house, I prayed for her safety and recalled years worth of memories from the office. Upon arrival I saw the men and women of several Fire Departments. Emory, Alba and Quitman are the ones I recall being there….along with members of the Rains County Sheriff’s Office. They were coordinating a search of the area. These professionals were urgently trying to find Janice. As they did a ground search, a DPS helicopter was called from Garland to do an aerial search using infrared and visual aides. The helicopter made an intense search but had limited fuel and had to return to base. This did not deter the ground forces. They searched until approximately 1 a.m. Sunday morning with no results. After a few hours of restless sleep I returned to the scene to find exactly what I knew would be waiting. These dedicated men and women were back on location continuing the search. Young men from the ALERT Academy near Big Sandy had been called in to help. They gathered their gear to do a grid search of the small lake behind the house. Three divers entered the water in different locations around the pond. Within an hour of entering the water, the worst fears of the family and friends became a reality. Janice’s body had been found. The anguish and heartbreak of her family and friends was almost more than one could bear to witness. As the realization of what had happened began to sink in I dreaded what I had to do next. I had to call the office staff and tell them that our friend, our family member had been found. I don’t recall who I called but they said they would spread the word to the others. We have all worked through this week in a trance, unable to comprehend that Janice wasn’t answering the phones for us. She wasn’t there to make sure we were alright. I would like to thank the citizens of Wood County, Texas for the calls of support and for helping us through this time of grief. Janice’s memorial service will be Saturday morning at 10:30 @ Wilson-Bartley Funeral Home in Alba. A private burial will be held later where Janice will be buried by her beloved son. Please pray for her family tomorrow and pray for her extended family of 12 years. Where do I begin? Tragedy has struck our community once again. Last night, Ally Baker, age 9, went to be with the Lord. This vibrant, beautiful little girl had a brain aneurysm while playing on the playground of a local church. I did not know Ally personally. I’ve known her grandparents since childhood and have known her daddy, Shaun, all of his life. I’ts times like this that we realize how fragile life really is. Here was Ally, at church, enjoying fellowship with others and suddenly she is gone. Quite frankly, these are times that we realize there are things in this world that we do not understand. This is one of those times. Mom couldn’t figure out WHY she was alive in the state she was in. I can’t comprehend the WHY behind the sudden death of Ally. Death is as sure as being born. It is a fact that we will all die someday. It is equally true that I can’t and never will be able to answer the question of why? The older I get the more I realize that the mysteries of this world will continue to be mysteries. I would like to share a few scriptures from God’s Word that comforted me years ago and I pray will comfort Ally’s family as they cope with here loss. Shaun, Lindsey, and the rest of the family I hope you can picture Ally as being that little child. Can’t you just picture her sitting in the lap of Our Lord and Savior, Jesus Christ? She is laughing, smiling and nestled in the arms of the Creator. I know you long to hold her but take comfort in knowing that she is in Heaven….the place we long to be. 2 Samuel 12:22-23 And he said, While the child was yet alive, I fasted and wept: for I said, Who can tell whether God will be gracious to me, that the child may live? We cannot bring our loved ones back but we can follow David’s example and go, someday, to be with them. Shaun and Lindsey, you likely have so many unanswered questions. One question is answered….your little angel is in the presence of the Lord, Himself. My prayers and the prayers of many are with you. A donation account has been set up for the Baker family at City National Bank in Quitman to assist with funeral expenses. I would like to introduce you to a remarkable young man. His name is Josh Hass. Josh is 14 years old and is a student at Alba-Golden High School. He lives in Alba, Texas with his parents, Brandon and Paula. He also has an older sister, Samantha. He is a typical teenager. He loves the outdoors and being with friends. Weight lifting and football are at the forefront of his athletic endeavors. Josh has a passion for mudding…whether with his bike, go-cart or anything else with wheels. He enjoys fishing, hunting and riding horses with his best buddy, Carter Lennon. His parents made sure he was raised in church and he is very active in the youth group at his church. This Bible training and his Love of God would soon prove to be invaluable in what was to come in his young life. This young man’s life changed on August 10, 2011. Josh and some of his friends were riding in an all-terrain vehicle when the vehicle rolled over. Josh was thrown from the vehicle and it is believed that he was struck by one of the roll bars. He was immediately flown to a Tyler hospital with severe head injuries. Tears and prayers began as the friends and family gathered at the hospital. I would estimate 50 to 75 people were gathered in the front of the hospital. All seemingly in shock over this accident. The first news from the family was not good. Josh was in grave condition as the doctors did what they could to save his life. His 14th birthday came and went while he was in ICU. Josh spent several weeks in the hospital. He is a fighter and with prayers, the Grace of God and the staff of the hospital, Josh began to respond to treatment. His physical health began to improve but the news was not all good. The accident had injured Josh’s optic nerves causing him to lose his sight. Josh and his family have been on an emotional roller coaster ride since the diagnosis. They visited many specialist. At times they would receive encouraging news only to be devastated when Josh’s condition did not improve. He went through a time of depression that would be expected for anyone who had gone from an active lifestyle to being unable to do the things he loved. It didn’t take long for Josh to get past this stage and amaze his family and friends with his “can do” attitude. Since the accident he has begun learning to play the banjo and guitar. He continues to be active in his youth group. He is very active in FFA. He is on the dairy judging team and raises and shows his goat in competition around the area. Recently, he went on a two day judging trip. I think his mom was more worried than Josh. He convinced her he would be fine without her going with him. His friends, Carter Lennon and Danny Osborn, roomed with him. They had a great time and all went well. Josh and his family will be heading to a doctor in Cleveland, Ohio. This doctor practices Maridain Acupuncture. New research suggests that acupuncture can possibly heal and restore some nerve damage. This doctor combines treatment with prayer services. Paula has talked to a lady whose son’s sight improved after this treatment. Another patient went from a quadriplegic to using a walker after receiving treatment and prayer. Several fundraisers are planned to help this family defray some of the travel expenses for this family. The Josh Hass 5K will begin at Golden Grocery March 31st at 7:30. The cost is $20 per person. You may register on race day or before. Registration forms are available at Golden Grocery. Breakfast burritos will be available for purchase after the run. All proceeds will go toward travel cost for Josh’s doctor appointment in Ohio. There will also be a garage sale/bake sale at the Golden pavillion on April 6 & 7th. Make plans to attend and help this family in their quest to seek treatment for Josh. Please continue to PRAY. I’ll close with a quote from Josh’s mom…”I see God’s Grace through Josh every day! Have a good day, be good to each other and May GOD Bless..
God’s Plan for each of us is quite amazing. Many occasions finds us being in just the right place at the right time to meet someone who changes your life forever. That is exactly what happen to bring Megan into my life. Today is Megan’s birthday and I would like to tell you her remarkable story. Time slips away but I believe it to be sometime in 2004. My mom had a severe stroke and she was in the hospital in Tyler. I was in such fear that I would lose my mom, I spent all the time I could with her. During my early morning visits I noticed this same family sleeping and resting in the waiting room. One day we struck up a conversation. Their daughter, Megan, had been in a horrible automobile accident. There was a time where the doctors didn’t give them much hope and even if she lived they did not know the extent of the brain damage she had suffered. This routine of talking with her family and checking on Megan’s progress continued for several weeks. I’m not sure some of her family ever left that hospital. As the weeks progressed, Megan’s condition improved to the point that she was no longer in danger of dying. I remember it like it was yesterday. I arrived at the hospital and Megan’s parents told me they were transferring her to Dallas to a rehab hospital. I waited outside the door and finally got my first glimpse at this miracle teen. Megan was asleep on the stretcher or possible they had sedated her for the trip. What a beautiful young lady! Oh, how I prayed that God would be with her. I did exchange phone numbers with her mother and was able to keep up with Megan’s progress. Megan continued to progress and we kept in touch through emails. I finally called her number and was able to hear her voice for the first time. We talked for what seemed like an hour. She told me she was still having some memory problems and problems with her speech but overall she was doing good. She had finished high school and was enrolling in college. She relayed just another way God changes our plans sometimes. Megan explained to me that before the accident she really didn’t know what she wanted to do with her life, but since the accident it had become crystal clear what God had intended. She was going to school to be able to help others who had sustained brain injuries such as she. Megan graduated from Stephen F. Austin State University in 2008 · with a B.S. in Communication Disorders. In 2011, she received a MS · Speech-Language Pathology from Stephen F. Austin State University. She now works as an SLP-CFY at Lighthouse Therapy Services. I was sitting at home one night watching television when my phone rang. Little did I know, I was about to get the surprise of a lifetime. It was Megan. She was engaged to be married and made a call to tell me. Now I will say that made me about 8 feet tall but the best was yet to come. She asked if I would perform the wedding ceremony for her and Alex. I had a smile so big if I had died at that moment it would have taken the undertaker a week to wipe the smile off of my face. The ceremony was to take place in Nacogdoches on a Sunday afternoon. I was unable to make it to the rehearsal so immediately after church on Sunday I drove to the site of the wedding. It was located in a park with many old buildings…sorta like an old western setting. The church was an old church that the historical society had restored to it’s original condition. Old wooden floors, pews and elevated pulpit..the works. Simply beautiful. I asked around to see where Megan was waiting. As I said earlier, the only time I had saw Megan, she was being loaded into an ambulance for a trip to Dallas. I walked in this old restored house and saw her for the first time. I have no words to adequately describe the beauty of this miracle young lady. The very first time we actually spoke in person was at her wedding. Thank you Megan. That stands out as one the fondest memories of my ministry. So very proud of all you have overcome to get to this point in your life. Happy Birthday and May GOD continue to Bless You, Alex and your families. I will begin with a confession. I am a mama’s boy. Have been all my life and I’m surely not about to change that now. I’m positive that every little boy’s first love is his mom. No matter what happens throughout your life, mama is always there to celebrate with you or to make things better. I am very fortunate that my mom is still alive. 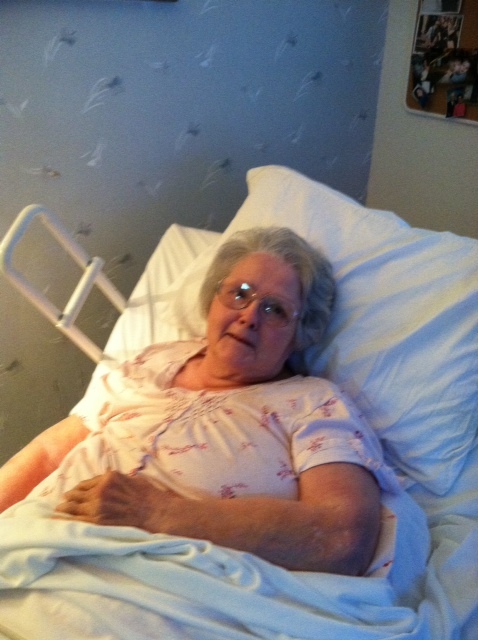 Although the stroke took her ability to talk and has immobilized her, she is still mom. She has a way of looking at you and getting her point across without having to say a word. My mom has ESP. I don’t know if any of you have a mother with that sense. Nobody knows their children like a mom. I’m sure that my mom had someone following me during my teen years. There is NO WAY she could have known so much about someone who thought they were so sneaky. She knew things about me before I did them!! Some I don’t remember doing?! She does! I’ve come to realize that the nearest thing to the Love that God has for us is the Love that a mother has for her children. My mom was and is a very meek person. She wouldn’t harm a fly….that is until it came to her children. Don’t misunderstand, mom was not one of these moms that would show up at school to create a stink cause her “little boy” got his rear end lit up. No, she would be the one to pick me up from school, thank the teacher for whipping me, find out the details, then take those detail home to dad. I will say this…she would always smooth it over with dad before he got his turn at bat. Mom’s are the ones that little boys tell their problems. I’ve teased mom now that she cannot talk. I still tell her things that are going on, troubling me, etc. Of course, now that she can’t respond I tell her I will just make up an answer for her. Mom always had a way of lifting an eyebrow to let you know her displeasure or to be more exact, to let you know she knew you were lying through your teeth. She hasn’t lost that ability. I have a terrific mom. I understand that is not the case with everyone but I’m sure thankful that God gave her to me. I’m sure that God realized that not just anyone could have raised me without going stark-raving mad. I look back on life and realize that without mom I would probably not have made it out of my teenage years. The past few years have been very difficult for her. Mom is a caring person and the stroke has left her unable to do the thing she loved most. Caring for others. I’ve seen my mom give her last dollar to someone less fortunate. She went to so many visitations and funerals over the years that if one person from each family comes to her’s we will have to conduct it in a stadium. Mom would always be among the first to bring food, give a hug and comfort those who had lost loved ones. I’ve seen her laugh with families and shed tears with them during their deepest hurt. Mom was a talker. Come to think of it, so was dad. No wonder I talk too much. Mom was constantly telling me that my mouth would cause me much grief in my lifetime. She was right. Mom was not perfect…but by golly she was close enough to perfect for me. In the ministry, I find myself starring death in the face far too often. Most of the time it is someone who have lived a long fulfilling life and is ready to go home to see Jesus. On occasion the I find myself thrust into the past when dealing with a family who has lost a child. The natural progression of life leads us to believe that parents are not suppose to bury their children. Unfortunately, this is not always the case. I’m reminded, as I was yesterday, that I’m not the only parent who has had to face this life altering experience. You never get over it. The best you can hope for is to learn to live with it to the point of being able to survive. I have always found the 18 Chapter of Matthew to be of comfort. I never read this verse that I don’t see Kyle as the one Jesus called “in the midst of them.” This has helped me on many occasions to realize that my young son is in Heaven and wouldn’t come back to this earth if Jesus Himself gave him a quick round trip ticket back to earth. Once you’ve seen Heaven I can’t imagine that Earth has any further appeal. I’ve attended the death of a few children during the last 8 years. It is a most traumatic time and in more than one case I have totally failed the family. I do think the loss of my son has prepared me to a point to help others or, at least, somehow be able to understand their pain. There are some does and don’ts when trying to ease and comfort those who have lost a child. So many times we try to use scripture to comfort. That is a good thing but be very careful. Here is one of the most famous that we tend to use. This is a beautiful verse and it is true, as is all of God’s Holy Word, but at the moment of grieving parents do not understand and in my humble opinion the absolute worst thing you can say to a parent is “something good will come out of this” or “the child is in a better place.” Again, this is a correct statement straight from God but to a grieving parent the best place for their child is in their arms. The greatest response you can give someone who has lost a child is to put your arm around them, tell them you love them and will be praying for them. 2 Samuel 12:23 But now he is dead, wherefore should I fast? can I bring him back again? I shall go to him , but he shall not return to me. This is a verse that each one should take to heart. We cannot bring our loved ones back but we can Trust the Work that Jesus did on the Cross and accept the “Free Gift” of salvation. Then we have an iron clad guarantee that we will not only see our loved ones again but spend eternity in the presence of God. Thanks for allowing me to post this. Sometimes you just got to get it out.